Ebenezer Wake Cook moved to Australia from England when he was eight years old. In Melbourne he was given art lessons by Nicholas Chevalier, whom he described in later life as ‘my dear old master’. Between 1870 and 1872 he studied at the National Gallery of Victoria’s School of Design. 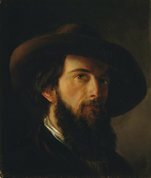 He was a foundation member of the Victorian Academy of Arts in 1870, and also exhibited with the New South Wales Academy of Art – the parent institution of the Art Gallery of NSW – in 1872 and 1873, after which time he returned to England to embark upon a career as a professional painter. 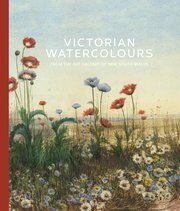 In London, Cook exhibited landscapes and popular continental views at the Royal Academy and the Society of British Artists (Suffolk Street), as well as the Dudley Gallery and the Royal Institute of Painters in Water Colours. He was a member of the Royal British Colonial Society of Artists (founded in 1887 as the Royal Anglo Australian Society of Artists), an association that ‘contains the cream of the other societies’, as Cook affirmed in one of his letters to the Gallery. Cook’s small-scale English works such as Near Ripley, Surrey – an evocation of spring in a densely wooded landscape with children picking bluebells – can be particularly enchanting. By the early 20th century, Cook’s painting style and idyllic vision belonged to the past, and critics could dismiss his work as trivial and pretty. Now the author of two reactionary, anti-French studies, Anarchism in art and chaos in criticism (1904) and Retrogression in art and the suicide of the Royal Academy (1924), Cook had set himself up as the enemy of the avantgarde.